Please note that the content of this book primarily consists of articles available from Wikipedia or other free sources online. 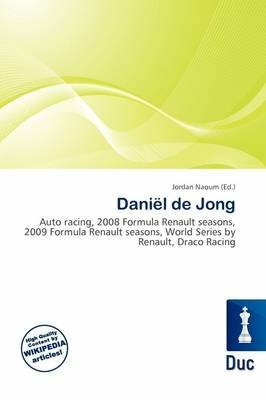 Dani l de Jong (born 9 July 1992 in Rotterdam) is a professional racing driver from the Netherlands. After a lengthy karting career in his native Holland and a brief stint in the Dutch Winter Endurance Series, de Jong made his single-seater debut in 2008 in the Formula Renault 2.0 Northern European Cup (NEC), finishing the season 13th overall. He also contested two races in the Formula Renault 2.0 NEZ series, taking two pole positions and a race victory to finish the season in 8th place, and a single round of the Formula Renault 2.0 West European Cup at Spa-Francorchamps.